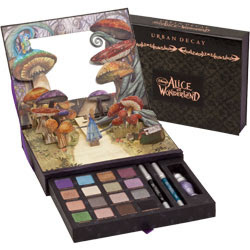 Beauty Must-Have: Urban Decay Alice in Wonderland Book of Shadows | Fashion. Style. Beauty. | Life is short. Live well. I don’t know about you, but I am beside myself waiting for Tim Burton’s Alice in Wonderland to hit theatres. From the previews, it looks like Burton will put his incredible imagination behind the age-old tale in a way that would even surprise Lewis Carroll. I love whimsy and magic. Speaking of whimsy and magic, we also know that I’m a fan of the genius beauty brand Urban Decay and when a little sample of the gorgeous Alice in Wonderland Book of Shadows inspired by the forthcoming film arrived recently, I basically gasped with joy. Urban Decay’s done it again, with a pop-up detail that reveals the scene where Alice first walks through the mushroom forest, discarded “Drink Me” bottle cast aside as she’s stares on with wonder under the watchful eye of a hookah-smoking caterpillar. This is all in front of the mirror. Talk about presentation. Open the secret drawer and you’re treated to no less than 16 of Urban Decay’s best-selling shadows with themed names like “White Rabbit” and “Jabberwocky.” Along with this treasure trove of shadows are small version of their Eyeshadow Primer Potion and two coordinating 24/7 Liner Pencils. If I was trying to figure out what to do for makeup during Fashion Week, this would be it. This is a must for the beauty loving movie buff. Put your name on the wait list and be one of the first to get your hands on one today.